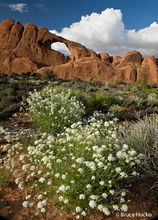 Home, for me, is a landscape, not an address, and my chosen home is the land around Moab, Utah. While the people make it a wonderful place to live and work, it is the land that has lured me here and given me cause to stay. There is so much diversity and beauty to behold in just a few minutes from my door. While forays into this country often necessitate days, one can find quiet refuge within a short drive and a few minutes of walking. When photographing I feel the land has a much to say as I do, and so one thing I do in addition to setting up, selecting lens and all that stuff..........is to listen to what it has to say.